It's been awhile since I had time to add to my blog…but here we go…new images of delightful places…enjoy! Here're some new photos of a stunning landscape in Coronado we began installation on some 8 months ago. Look how beautiful…the plants are established and 'showing off' with color and proportion. The two Melaleuca trees (which we continue to bonsai for the client) are simply 'jewels' in the landscape. 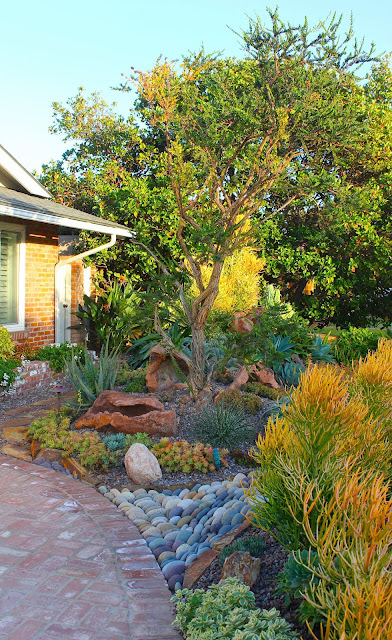 Naturally, we adore our Coronado clients…we're working on a new landscape design right now, just down the street…bayside as well…photos of that transformation are coming soon! One really must see this garden in person…both the Melaleuca's were laced out to create an open, bonsai-style tree shape…this distinctive form, along with the trees' inherent paper-like bark, support an original & elegant front garden in Coronado….and it's easy to see how the shapes and colors of both the plants and the rock material share an imaginative even 'jewel-like' visual relationship. 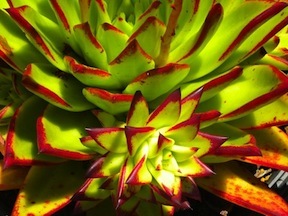 I adore this multi-headed Red Echeveria and the way it 'bursts forth' from the lava bowl. Details…in movement…color…form…texture…in the afternoon light. We added the flagstone slab bench recently…a lovely spot from which to enjoy the garden. Red Echeveria and lava bowl…front side view. An inviting entry walk-way to this wonderful, wonderful, Coronado bayside home.